After much spiritual debate I have decided that I do have regrets. I tried living in the "I have no regrets" camp only to find out that I have no taste for their s'mores (camp analogy.) Look, I have all sorts of regrets and allowing myself to become fixated on them from time-to-time is making me a better person. I think this all came to a conclusion when I was reading my friend Amanda's blog yesterday. She mentioned a time when I pressured her to slide on her bottom down a massive grassy hill outside of Edinburgh. Having just done it myself I stood at the bottom calling her all sorts of names until she finally gave in. I heard a sickening snapping sound when she tried to stop towards the bottom of the hill. Then she screamed. Then did I ever have a terrible regret. And it is still here, in my heart. I think the permanency of regrets are necessary so that we don't repeat negative behavior. I have never pressured anyone to do anything since that horrible tragedy in Scotland (did I really just type that big fat lie?) Regrets should be seen as a psychological system that basic human beings require for mature cognitive functioning. Or in other words, regrets are great! I regret conversations, haircuts, shopping expenditures, wasting time, not wasting time, getting two dogs, staying too long at social functions, eating crap, eating crap on a stick, not being with Chup in the Bahamas this weekend, spells of apathy and so much more! Lucky for me, I do find that the older I get the less regrets I gain. I credit my mental "regret cookbook" for this success. When I mix my opinion on my vegetarian lifestyle with certain members of my family I get a fat over-done regret. Or, when I answer my phone without looking at the caller id I get cellular regret. It is just that easy! I am going to let you in on a little secret: my biggest regret. My biggest regret ever, the one that pains me to think about for more than five minutes straight is my 1994 Junior Prom Dress. Being the aspiring fashion designer that I was at sixteen (I wrote my high school's fashion column "The Dizz") I insisted on designing my own dress and having custom made. I wasn't going to fall for that brocade debacle and don't get me started on taffeta nor velvet with lace collars. I knew the disaster that they were even back then. After many, many hours of research alone in my room listening to Counting Crows I decided on a black silk full skirt and a fitted bodice with a sizzling sweetheart neckline. For creativity purposes we shaped the sleeves with a sheer fabric, and after many fittings the dress seemed perfect. That evening my friends helped me get ready (the dress was painfully hard to get into) while I kept my eyes closed. When all was done, I took a deep breath and gazed at myself in the mirror. I looked like nothing like the vintage vixen I had hoped to be, instead more like Morticia Addams. Which would've been fine had I been a Goth. Though he never told me, my boyfriend/date hated it too. I think he would've preferred velvet and lace. And so it is a more than a decade later I sometimes find myself perusing vintage websites looking for my lost prom dress. 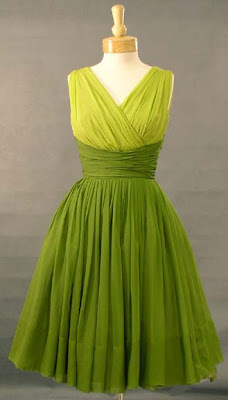 I haven't found it yet, though I do fancy this two toned chiffon cocktail dress from vintageous.com (featured above.) I just found it today when I was thinking about that fateful day with Amanda in Scotland. Perhaps the green is an homage to our story. But can you image the shoes I could've worn with this dress? Oh honey, no regrets there. Anybody else out there willing to celebrate your regrets?